This promotional poster has been created to raise attention to the ZER01NE Day, a biannual event that gathers an audience with a passion for art, technology and business. As creative network platform, it targets and invites people from a wide variety of different professional backgrounds to meet up and exchange ideas, network and share new skills concerning new forms of communication, smart technology and art. The poster aims to visualise this main fun-ction of the event by featuring the striking face of a mask. While the mask’s open mouth hints at the many conversations that take place during the event, the mask’s eyes look almost like glass spheres and point to the bionics or robotics presented in the course of the event. Mental input is symbolised by some sort of firearm ammunition heading towards the forehead on the right side of the poster, while the logo is interpreted two-dimensionally as a truncated zero and a one, or three-dimensionally as half a sphere and a funnel, which is formed by the one, depicted additionally on two paper cups below the mask. Thus, the poster also typifies the start-up studio ZER01NE as a creative space and networking platform comprising a communication room, a kitchen, laboratories, a library, a media room and a lounge. 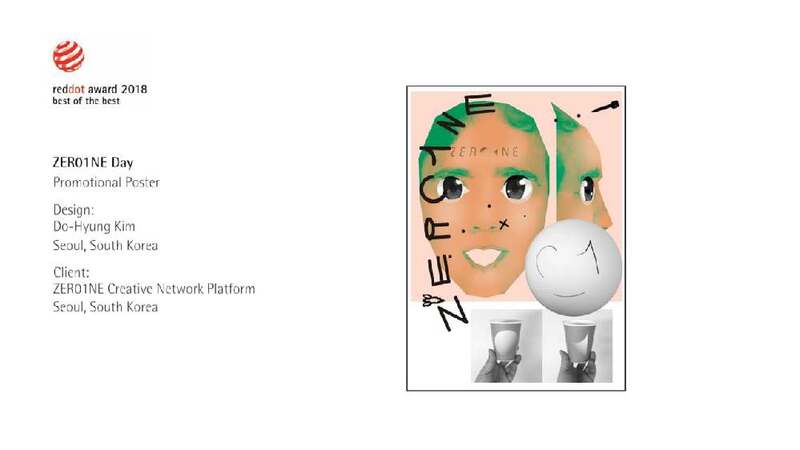 The poster for the ZER01NE creative network platform and its biannual event manages to creatively implement the very notion of being a high-creativity network in a unique manner. The power of the visuals and the simplicity of the depictions do not give away too much detail and thus pique curiosity and encourage viewers to decode their meaning. Illustration, typography and photography thus combine to form a highly stimulating appearance.